Flintlock pistols may have been super effective against single opponents because, as Boris the Bullet Dodger once said, "If it doesn't work you can always hit them with it." 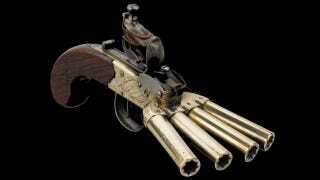 Against groups, however, they were comically useless—that is, until enterprising gunsmiths added some extra barrels. Officially known as Volley Guns but colloquially dubbed the "duck's foot" (given their resemblance to the fowl's webbed feet), these multi-shot pistols compensated for unbearably slow reload times—upwards of two minutes or more—by unleashing multiple rounds in short order. Like a Victorian era version of Contra's spread gun, these unique firearms were quite powerful, typically employing .45 caliber or larger ball shot, and relatively fast, able to fire all barrels simultaneously or in rapid sequence.